These two antagonistic opinions exemplify very well the debate surrounding constitutional review. Indeed, on the one hand, the apprehension of a tyrannous judicial power is reinforced in the United States by the fact that the US Supreme Court has self-assigned in Marbury v Madison (1803) a task it was not delegated by the 1787 Constitution. Therefore, its detractors are used to saying that the Supreme Court is the most separated and the least checked of all the branches of government. In France, the origins of this apprehension take us back to the French Revolution of 1789 and to the revolutionaries’ hostility towards this kind of control. Indeed, they strongly mistrusted the Ancien Régime Parliaments, as show the laws of August 16-24, 1790 on the Organization of the Judiciary, according to which : « Les tribunaux ne pourront prendre directement ou indirectement aucune part à l’exercice du pouvoir législatif, ni empêcher ou suspendre l’exécution des décrets du Corps-Législatif, sanctionnés par le Roi, à peine de forfaiture » (courts shall not be allowed to take part, directly or indirectly, in the exercise of legislative power, nor to prevent or suspend the execution of the Legislative Branch decrees, sanctioned by the King, under pain of forfeiture). This fundamental reticence vis-à-vis any form of control of the law, said to be the “expression de la volonté générale” (the expression of the general will) in article 6 of the Declaration of the Rights of Man and of the Citizen, explains the conditions in which constitutional review appeared and developed in France. Therefore, this apprehension used to be institutionalized by the refusals of the Cour de Cassation (see Cass. Crim. 11 mai 1833, Paulin and Cass, Civ, 2e, 20 décembre 1956, Bull civ. N° 714 p. 464) and the Conseil d’Etat (see S. 6 novembre 1936, sieur Arrighi, rec p. 966 ; D. 1938. 3. p. 1, conclusions Latournerie et note Eisenmann) to conduct this constitutional review. It was only in 1958, with the coming into force of the October 4th Constitution, that a separate body, the French Constitutional Council, was empowered to ensure the consistency of statutes voted by Parliament with the Constitution. Besides, until very recently, only a limited set of political actors were allowed to refer statutes newly passed by Parliament to the Constitutional Council during a brief window before they enter into force. On the other hand, many people share Alexander Hamilton’s view and consider that this is a risk to take if you are willing to guarantee the supremacy of the Constitution. Indeed, if there is no control, the legislator is perfectly free to infringe the Constitution. As a consequence, constitutional rules would not be superior to statutory law, nor even enforceable. For instance, the French legislator could with impunity go beyond the area of competence it was allocated by article 34 of the Constitution and, thus, violate the separation of powers principle enshrined in article 16 of that same text. This example also applies to the American federal legislator, even though the “necessary and proper clause”, also known as the “Elastic clause” ( Article I, Section 8 ) as well as the “Commerce clause” extend substantially the list of enumerated powers assigned to the legislative branch by Article I of the US Constitution. Besides, a recent constitutional revolution in France put new life into this debate. Indeed, since March 2010, French individuals are from now on allowed to challenge statutes in force if they deem their provisions violate their constitutional rights. This procedure is known as the “Application for a Priority Preliminary Ruling on the Issue of Constitutionality” or, in French, as the “Question Prioritaire de Constitutionnalité”. More precisely, according to article 61-1 of the Constitution, it establishes “the right for any person who is involved in legal proceedings before a court to argue that a statutory provision infringes rights and freedoms guaranteed by the Constitution”. This innovative procedure, induced by the Constitutional Reform of July 23rd 2008, contrasts with the principle followed in the United States (and elsewhere) of constitutional litigation as a last resort. Moreover, as a post-promulgation review, it permits the removal from the French legal system of unconstitutional statutory provisions that had gone unchallenged until then. Finally, it reaffirms the place of the Constitution at the apex of the French legal order. This new procedure thus facilitates the comparison between France and the United States since French and US citizens have henceforth equal access to constitutional litigation. Besides, the French Constitutional Council and the US Supreme Court both have a leading role concerning the protection of human rights, which raises issues concerning their democratic legitimacy and their relationship vis-à-vis the other branches of government. Therefore, to what extent does the ambiguous relationship between these two constitutional courts and the other branches of government allow them to play a key political role regarding the protection of human rights ? The equivocal relationship retained by the French Constitutional Council and the US Supreme Court with the other branches of government derives from their duty to preserve the integrity of the provisions conceived by the “pouvoir constituant” and, subsequently, their natural tendency to be considered as superior to the “pouvoirs constitués” (I). Therefore, in spite of the legitimacy issue it engenders, this specific status has sometimes led them to cross the controversial boundary between interpreting law and engaging in judicial activism (II). Defining the position of constitutional courts vis-à-vis the other branches of government is quite delicate given the very singular task assigned to them. Besides, constitutional judges can be either members of a separate body like the French Constitutional Council or members of a last resort court like the US Supreme Court. But, if we set these differences aside, we can observe that, in both cases, these two constitutional courts are clearly involved in the relationships between the “pouvoirs constitués” (A) which raises the issue of their democratic legitimacy towards them (B). 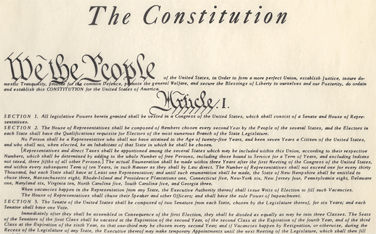 The US Constitution and the French Constitution are both a corpus of norms drafted by the “pouvoir constituant”. These norms are supposed to set up the government organization by assigning specific functions to three determined branches. Therefore : (1) the legislative branch is supposed to select the governing rule of law and to enunciate it ; (2) the executive branch is supposed to precise the formulation and the general field of application of this rule of law ; (3) the judicial branch is supposed to decide whether particular facts fall within the governing rule. Each of these specific branches is known as “pouvoirs constitués”. These three “pouvoirs constitués” are required to operate harmoniously and not to encroach on each other’s area of competence. This goal can be achieved in several ways. For instance, these three authorities can remain largely independent from one another. Indeed, as provided by the famous quotation of Montesquieu : “Le pouvoir arrête le pouvoir” (the power stops the power). Nevertheless, Carré de Malberg remarkably demonstrated that such a conception of the separation of powers only ends up in highlighting the fact that the executive function is necessarily subordinated to the legislative branch. This goal of balance between the three powers could also be achieved by providing legal tools for each of the three branches, in order to prevent any of them from becoming too powerful : this system is known as the “Checks and Balances” doctrine. Nevertheless, any of these two systems has managed to reach a perfect balance between the three “pouvoirs constitués”. This is the reason why constitutional courts intervene : they are designated to control them and to punish any form of arbitrariness. It is called the separation of powers review. What is striking about the American system is that one the three branches is entitled to proceed to that review : in Marbury v Madison, the US Supreme Court was actually asked to deal with an allocation of power issue. In other words, one of the three “pouvoirs constitués” is supposed to regulate the separation of powers. But who will prevent the Supreme Court from acting unconstitutionally ? By the way, we could ask the same question about the French Constitutional Council : who is going to review its decisions ? We must refer here to the legal notion of nonacquiescence : it qualifies the situation where one branch refuses to acquiesce or to comply with the decision of another branch. Regarding constitutional review, this reaction often emanates from the legislature. Let’s study a few examples. One of the most famous examples of nonacquiescence in the US is when President Andrew Jackson refused to comply with the US Supreme Court decision in Worcester v Georgia (1832) : they had held that the Georgia criminal statute requiring all whites living in Cherokee Indian Territory, including missionaries and persons married to Cherokee, to obtain a state license to live there, was unconstitutional. President Jackson ignored this decision but the Court preferred to avoid the possibility of political conflict with the Executive. We may also refer to situations where constitutional decisions have been overridden by constitutional amendment. Indeed, constitutional review does not prevent the “pouvoir constituant derivé” from modifying the Constitution. In France, since the 1971 decision about the law governing associations, the Constitutional Council has authorized itself to review the consistency of statutes not only with the 1958 Constitution but also with the preamble to the Constitution and, incidentally, that of the 1946 Constitution and the 1789 Declaration of the Rights of Man and the Citizen. Therefore, by extending the norms of reference for constitutional review, it correlatively increased its area of competence and made the fear of a Governement by Judges reappear. But this fear can be counterbalanced by the fact that a Constitutional Council decision may always be overridden by a constitutional revision. For instance, on August 13th 1993, it censored a provision of the “Act on the control of immigration and conditions of entry, reception and residence for aliens in France”, on application of the Schengen agreements, because it violated the constitutional principle of right of asylum, enshrined in the 1946 Preamble. Consequently, the Constitution was amended on November 25th, 1993 which created a new article 53-1 about the right of asylum. Therefore, we can see than constitutional judges interfere within the performance of the “pouvoirs constitués” and that they cannot be treated on an equal footing with them. Given that observation, the issue of their democratic legitimacy arises. French Constitutional Council members as well as US Supreme Court Justices are not democratically elected : they are appointed. Indeed, the nine members of the French Constitutional Council are appointed by the President of the Republic and by the Presidents of each Parliamentary Assemblies (Senate and National Assembly). Besides, former Presidents of the Republic are de jure life members of the Constitutional Council, provided that they do not occupy a post incompatible with the mandate of Council member. This provision contained in article 56 of the Constitution clearly appears as an anachronism, especially since the Council role has remarkably increased since 1971. The members are appointed for a non-renewable nine-year term and there are no age or professional qualifications for membership of the Constitutional Council. Nevertheless, apart from Dominique Schnapper who is a Doctor of Sociology and the Director of Studies of the Ecole des Hautes Etudes en Sciences Sociales (EHESS), most of the current French constitutional judges have more or less a legal background. Indeed, Jean-Louis Debré, Guy Canivet and Jacqueline de Guillenschmidt are former judges from the judicial order. Valéry Giscard d’Estaing, Pierre Steinmetz, Pierre Joxe, Olivier Dutheillet de Lamothe, Renaud Denoix de Saint Marc and Jacques Chirac are graduated from the Ecole Nationale d’Administration (ENA). Jean-Louis Pezant used to be a public law teacher. Pierre Joxe is a former First President of the Court of Accounts. Renaud Denoix de Saint Marc is the former vice-president of the Conseil d’Etat. Guy Canivet is the former First President of the Cour de Cassation. Olivier Dutheillet de Lamothe and Jacqueline de Guillenschmidt are “conseillers d’Etat”. As for the nine Supreme Court Justices, they are appointed by the President of the United States “by and with the Advice and Consent of the Senate” (Article II, Section 2 of the US Constitution). They “shall hold their Offices during good Behavior, and shall, at stated Times, receive for their Services a Compensation which shall not be diminished during their Continuance in Office” (Article III, Section 1 of the US Constitution). From a comparative point of view, the most striking feature is that the US Supreme Court is openly politicized. Therefore, John Roberts, Antonin Scalia, Clarence Thomas and Samuel Alito are conservatives whereas Ruth Bader Ginsburg, Stephen Breyer, Sonia Sotomayor and Elena Kagan are liberals. Anthony Kennedy then appears as the “swing vote” which gives him tremendous power : his vote is nowadays the decisive one, the one lawyers will fight for. The issue which must be raised here is whether this politicization is not crawling in the French Constitutional Council as well. Indeed, the Constitutional Council has modified its rules of procedure in order to comply with fair trial requirements when it comes to applications for a priority preliminary ruling on the issue of constitutionality. Therefore, Article 4 now provides : “Each member of the Constitutional Council who feels that he/she should refrain from sitting when an application for a priority preliminary ruling on the issue of constitutionality is heard shall inform the President of this decision.” But it is specified that the mere fact that a member of the Constitutional Council participated in the drafting of the statutory provision which is the object of the application shall not per se constitute grounds for challenging the presence of the said member. As we can observe, constitutional judges’ legitimacy may very well be challenged on several grounds but we will focus here on the most wide-spread critique. Indeed, most detractors criticize the fact that they are appointed and not elected whereas they are entitled to set aside on a daily basis provisions voted by democratically elected members of the legislature. Nevertheless, the idea that legitimacy necessarily results from ballot papers tends to be reassessed nowadays : indeed, in a world as complex as ours, isn’t it quite simplistic to reserve credit only for elected candidates ? Moreover, setting aside unconstitutional provisions does not mean rewriting them. And, finally, the fact that their decisions do not depend on their approval rating allows them to hand down decisions they deem fair independently of what citizens may think, especially in hard cases. The French Constitutional Council and the US Supreme Court have thus a very specific status regarding the other branches of government and their democratic legitimacy, even though it does not derive directly from ballot boxes, is closely linked to their mission of protection of the Constitution’s integrity. Therefore, they sometimes feel allowed to cross the controversial boundary between the mere interpretation of the law and judicial activism. “Law is the grammar of power”. By exercising constitutional review, the US Supreme Court and the French Constitutional Council have perfectly understood it. In spite of the fact that this judicial activism is much less assumed by French constitutional judges who are still supposed to be the “bouche de la loi”, both of them are pioneers in the protection of fundamental rights (A). This is incidentally the reason why constitutional litigation is now submitted to fair trial requirements (B). Nowadays, social debates mostly evolve around the recognition or the scope definition of fundamental rights. Indeed, the right to abortion, gay marriage, gay adoption, surrogate mothers : all these debates aim at deciding whether human rights authorize people to perform specific acts. Most of the time, the legislature is afraid to take a decision and to resolve what tend to become passionate debates among citizens. Taking advantage of their status and their correlative independence, constitutional judges have taken over from the legislative power. In France, it may not be as visible as in the United States, but this is because of the specific role assigned to judges in France : the old fear of the Government of Judges has sentenced them to officially remain the “bouche de la loi” but we need to read between the lines. In the United States, the Warren Court (1953-1969) and the Burger Court (1969-1986) are considered as the emblematic period of liberal judicial activism. Constitutional civil liberties have considerably increased during this period and the examples of this activism are numerous. The most symbolic one is definitely Roe v Wade (1973) : the Supreme Court Justices legalized abortion partly on the basis of “right to privacy” expressed in the Fourteenth Amendment. In Brown v Board of Education (1954), it was also held that segregation in public school violated the Equal Protection Clause (14th Amendment). In Miranda v Arizona (1966), the Supreme Court ruled that criminal suspects should be given the “Miranda warning” prior to any interrogation by a police officer. In France, the July, 30th 2010 decision about the legal regime governing police custody is one of the most famous example of judicial activism of the French Constitutional Council since they have preferred to reserve controversial issues like gay marriage for legislative action. Nevertheless, the application for a priority preliminary ruling on the issue of constitutionality procedure is still very young and very promising regarding the improvements of the human rights legal regime. However, the 1975 decision about the Voluntary Interruption of Pregnancy Act deserves to be considered here. Indeed, apart from the fact that it sets up the classic refusal of the Constitutional Council to operate the conventionality control, the unrevealed motive of this decision lies in the will of the members to preserve the right of abortion enshrined in the statute they were asked to review. Therefore, if it officially resembles to an act of judicial restraint, unofficially, this decision remains a strong act of judicial activism in favor of the right of abortion. Constitutional judges’ decision to cross the controversial boundary between the interpretation of the law and judicial activism does not go without consequences. Indeed, fair trial requirements are imposed to constitutional litigation as well as in any other judicial proceedings, especially when it comes to the protection of impartiality. This question has become all the more acute as politicization of these bodies has enhanced. For instance, in the United States, as we have said above, Justices are publically identified as being affiliated to a specific ideology. 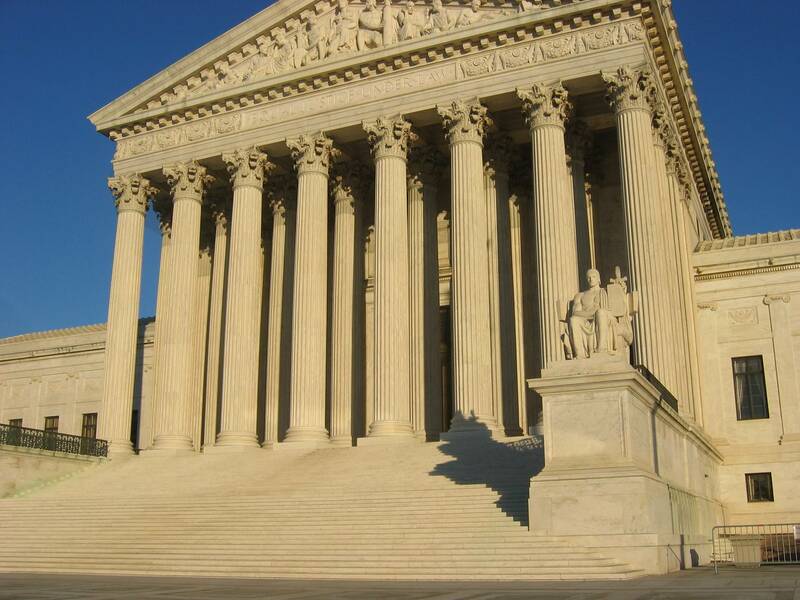 Nowadays, the US Supreme Court is thus considered by the popular opinion as a partisan institution. These political inclinations are referred to as judicial leanings : Justices are categorized as liberals, conservatives and moderates. However, these ideological lines play surprisingly a marginal role in the decision-making process of the US Supreme Court. It is effectively acknowledged that Justice Anthony Kennedy, generally considered a conservative, “occasionally votes with the liberals” : his “swing vote” thus determines the outcome in close cases. But, if we look at the statistics, in the 2009 term, half of the cases were unanimously decided, only 20% by a 5-to-4 vote and barely one in ten cases involved the liberal/conservative ideological divide. The explanation for this remarkable detachment of US Supreme Court Justices lies, for most of them, in their experience of judicial proceedings. Indeed, apart from Elena Kagan, all of the Justices have gone through the classic judicial career. Therefore, they are used to comply with fair trial requirements, as provided for instance by the Sixth Amendment. As for the French Constitutional Council, it is submitted to the requirements of article 6 of the European Convention of Human Rights. Indeed, in a June 23rd, 1993 decision Ruiz Matteos v Spain, the European Court of Human Rights has held that these requirements were applicable as soon as a decision handed down by a constitutional court was significant in the decision-making process. This is the reason why the Constitutional Council incorporated several measures aiming at ensuring a fair trial for applicants for a priority preliminary ruling on the issue of constitutionality. Therefore, the new rules of procedure provide that : “a party or the representative of said party duly vested for such purposes with a special power of attorney may challenge the presence at the hearing of an application of a member of the Constitutional Council.” But, as we have specified above, “the mere fact that a member of the Constitutional Council participated in the drafting of the statutory provision which is the object of the application shall not per se constitute grounds for challenging the presence of said member.” In the light of these observations, we may very well wonder whether the European Court of Human Rights will not, in a near future, declare that the Constitutional Council composition violates the principle of judicial impartiality, as it did in McGonnell v United Kingdom (ECHR, February 8th, 2000, n°8488/95). Indeed, members of the Council are usually appointed after a well-known political career, as Pierre Joxe for instance. Their impartiality thus depends on their will to comply with what Robert Badinter calls the “devoir d’ingratitude” (duty of ungratefulness). In spite of the material differences between the French Constitutional Council and the US Supreme Court, the same patterns are thus to be found in both models : a clear involvement in the relationships between the “pouvoirs constitués”, a democratic legitimacy issue, judicial activism in the construction of human rights regime and fair trial requirements. Nevertheless, the most striking feature remains this indissoluble bond between the “pouvoir constituant originaire” and current constitutional judges which have been significantly emphasized during the last few years with the originalism principle of constitutional interpretation. titulaire d’un M1 de droit des affaires, Univ. Panthéon-Assas. La Cour Suprême, l’Amérique et son histoire, Stephen Breyer (préface de Robert Badinter), éditions Odile Jacob, février 2011. Droit Constitutionnel, Francis Hamon et Michel Troper, LGDJ, 32e édition, 2011. « Anti-Ashwander : constitutional litigation as a first resort in France », Gerald L. Neuman, New York University Journal of International Law & Politics, Fall 2010. “ Congress, the Court and the Service Constitution : Article III Jurisdiction Control as a case study of the separation of powers”, Bruce G. Peabody, Michigan State Law Review, Summer 2006. “Judicial review and separation of powers in France and the United States”, Burn Neuborne, New York University Law Review, 1982. The Writings of Thomas Jefferson, Andrew A. Lipscomb, editor (Washington DC: The Thomas Jefferson Memorial Association, 1904), Vol. XV, p. 213, to Spencer Roane, September 6, 1819. Ibid, Vol. XI, p. 51, to Mrs. John Adams, September 11, 1804. According to Article I, Section 8 of the US Constitution, Congress possesses implied powers « to make all laws which shall be necessary and proper for carrying into execution » its enumerated or expressed powers. Furthermore, the “Commerce clause” gives Congress the right to “regulate commerce with foreign nations and among the several States”. Throughout the 20th century, the federal courts interpreted this clause a a means of expanding government power.